Cling Wrap is made from LDPE (Low Density Polyethylene) that is processed through cast stretch film extrusion that is presented to clients in the form of a roll. We produce various sizes and thickness. 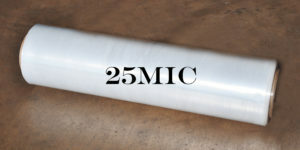 Cling Wrap is mainly used in the packaging market to wrap pallets for protection. This help to keep the product together when transported.